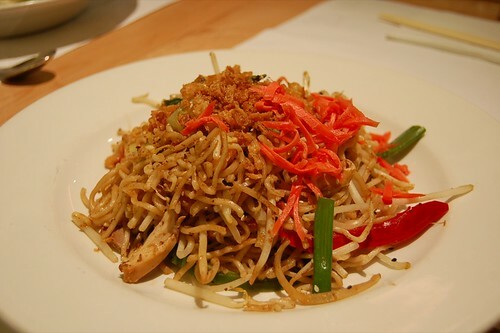 what the hell is a wagamama, you ask? according to site, it is a "willful / naughty child." what does that have to do with anything? i have no idea, but i do know that wagamama, by hungry hedonist terms, means "a noodle joint that leaves much to be desired." 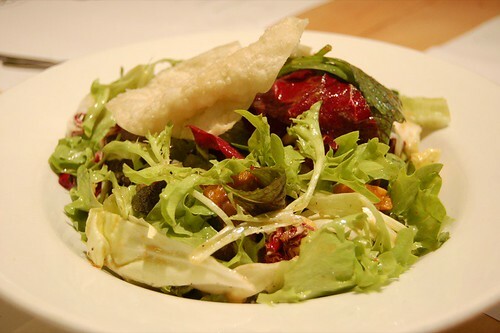 when i was in london, we visited a wagamama restaurant. we left with much to be desired. another vexing quality of this restaurant is the abandonment of proper capitalization. because these days, all-lower case + helvetica = hip. 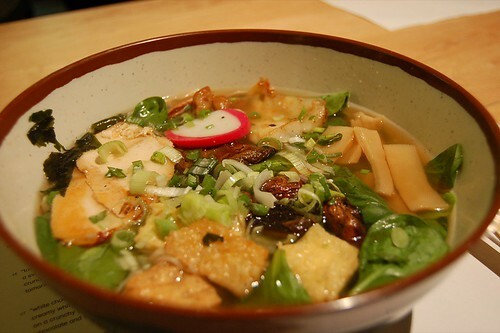 wagamama ramen: bland, flavorless soup; flavorless fried tofu; barely marinated bamboo shoots; flavorless, bland chicken. i liked the chopped scallions, i guess. can i describe the food here other than bland and flavorless? no. limp, lifeless noodles. 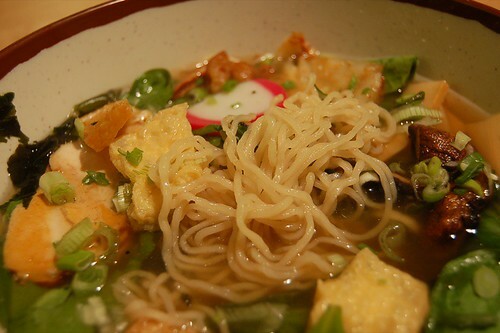 if these noodles were a child, it would be a wagamama. no, the mango sauce was not fresh nor tangy. yes, the coconut flakes were toasted. 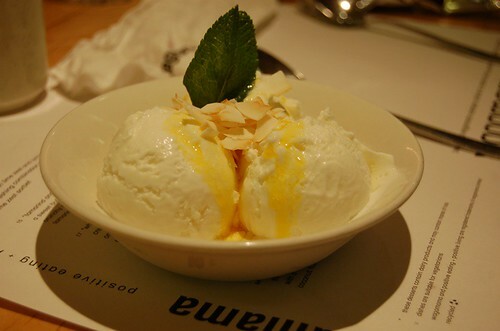 the dairy coconut ice cream was actually ok and the best thing we ate that night - because wagamama did not make it! you have since infiltrated australia, belgium, cyprus, denmark, egypt, ireland, netherlands, new zealand, switzerland, turkey, uae, and boston. Please stay away from New York and San Francisco, thanks. 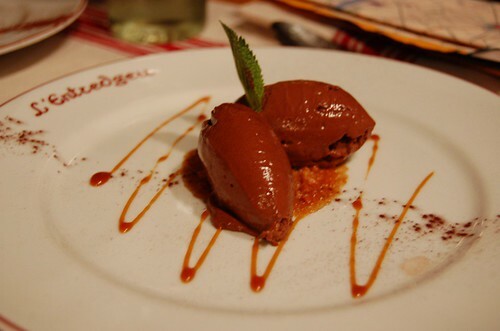 When A and I were planning restaurants, we had read about a well-regarded Parisian bistro that offered a great prix-fixe at 32 euros. 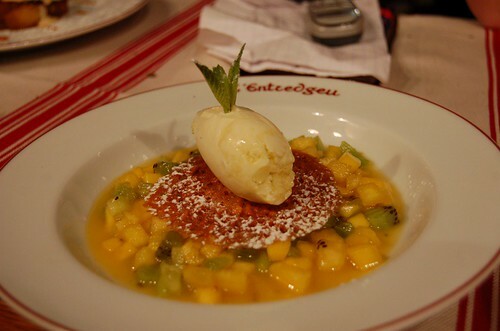 So on the first night we arrived in Paris, we rushed over to 17th to L'Entredgeu, which has been written up several times. I still can't pronounce the name, but I do know that it took a helluva long time to get to. 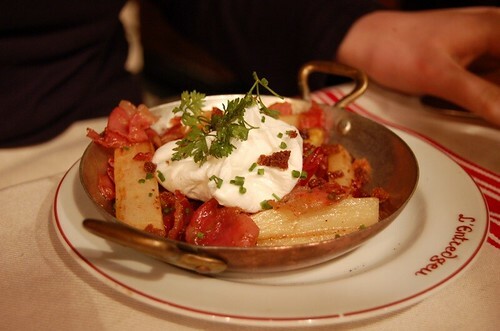 The dining room is the epitome of "authentic Parisian bistro." 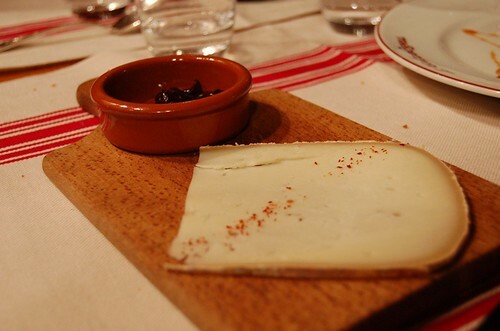 The wooden tables are covered with checkered red and white table cloth, dimly lit by the low lights overhead. The menu is hand-written on a chalkboard, brought to us by an extremely efficient Linguine-esque server. He might as well have been wearing roller skates. 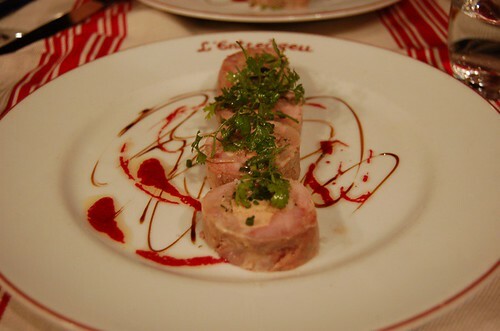 We started off with the quail stuffed with its liver, finished off with parsley and beet vinaigrette. The quail had a nice smoky flavor, which was piqued by the parsley and balanced out by the sweet beet juice. However, I was quite sated after two pieces - it was just a lot of meat to be eaten at once. I wish I had ordered this - this was one of the best dishes of the night. 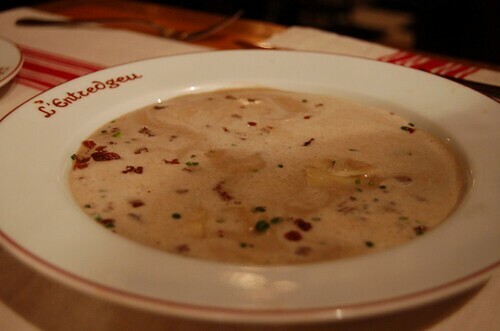 Warm white asparagus stalks were braised so tenderly that they just melted in your mouth. 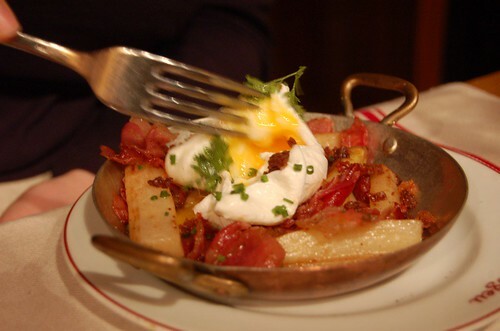 The bacon added a great smoky flavor, which was accentuated by the warm, runny egg. 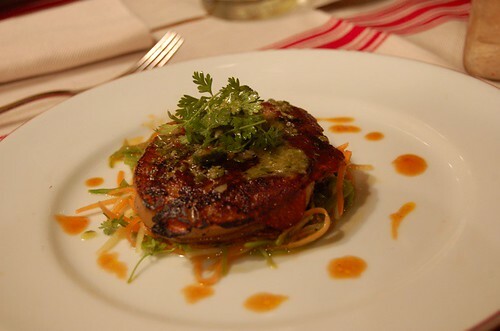 A generous portion of veal head was slow cooked, crusted and seared, and dressed with soy and sesame vinaigrette. 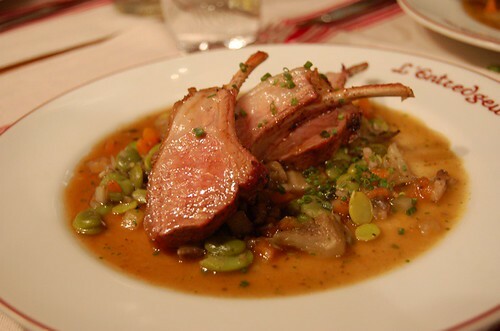 The flavors all worked together in a balance of sweet and sour, and the veal was nicely cooked. I just wish I got to taste more - the majority of the piece was fat. 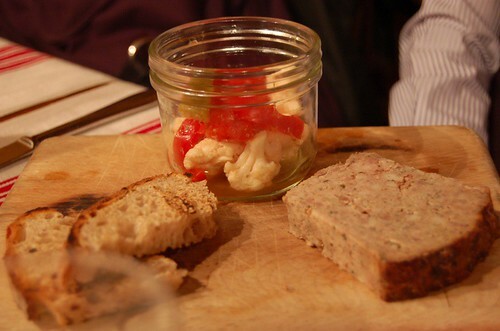 Another hit, the terrine was rich, livery, and tender. I had to say that I was disappointed with the chicken, which was rather bland and dry. The accompaniments were quite good, however. 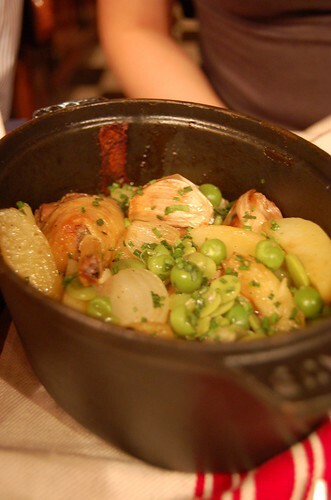 The potatoes, spring peas, and onions were slow cooked such that all the flavors fused together for a hearty stew. I just can't get over how bland the chicken was, given the great flavors it was cooked with. 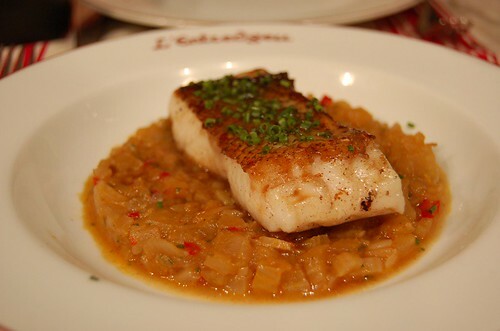 The seared cod fillet was perfectly cooked, with crispy skin and delicate, flaky flesh. The fennel, soft and sweet with the red pepper and langoustine, was great with the light fish. While the flavors were great initially, the enjoyment waned and I was bored halfway through. Gamier and fattier than necessary. Nothing too innovative, but done well. The best part was the ice cream - smooth, creamy, and intense with cinnamon flavor. You know how I feel about chocolate. 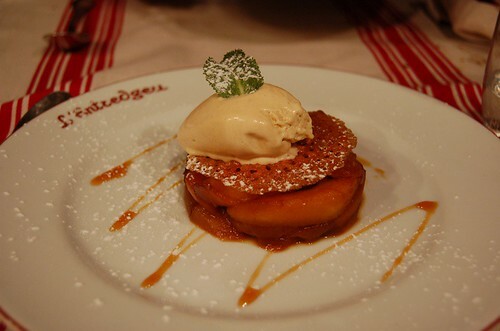 The best dessert of the night. This was just so refreshing: a grassy, citrus sorbet atop of a medley of mango, kiwi, and pineapple. Yes, this combination was not as exotic as I had hoped, but all the flavors, simple as they were, worked together for a flawless, cleansing dessert. 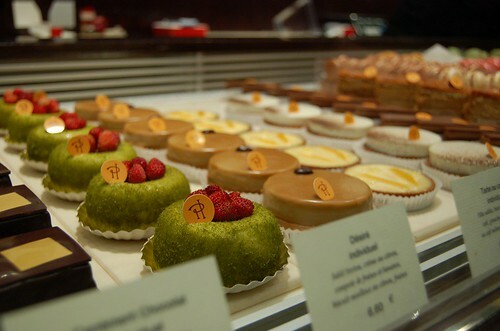 Ladurée and Pierre Hermé are known as two of Paris's (and therefore the world's) finest makers of luxury cakes and pastries. It is not only a feast for the mouth, but the eyes as well. 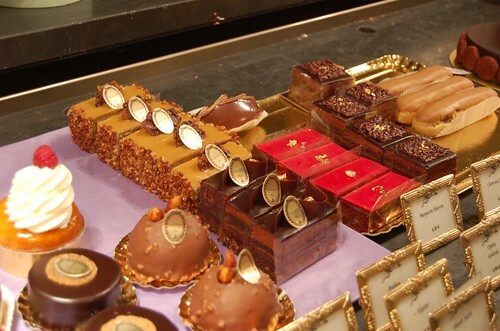 I set out to make sure that by the time I left Paris, I would not have to crave sugar for a long time. 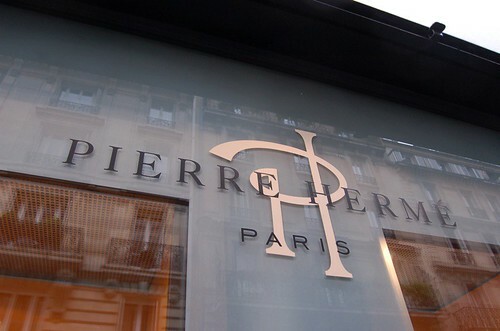 We arrived at Pierre Hermé on March 20, which turned out to be the day where you get 3 macaroons for free, granted if you donate money to the cause. I guess you don't have to, but you garner a really dirty look from the lady who works there. 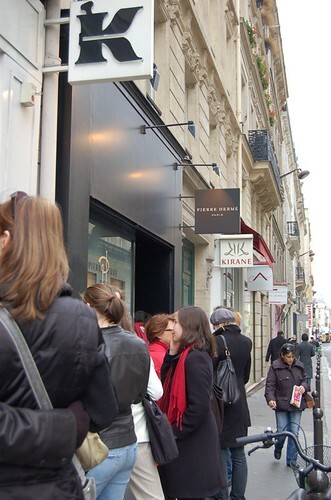 As with most free things, there comes a line - a really long one that eventually snaked around the corner. We finally reached the PH sign. 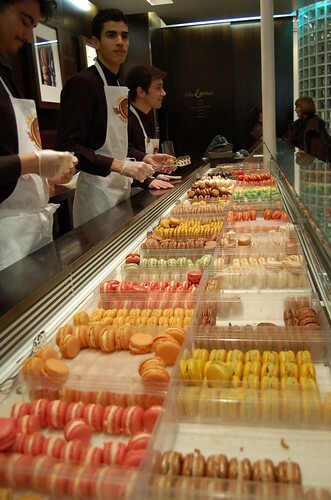 Rows and rows of macaroons. They handle with care. You get one of the red ones as part of the benefit. Fruits of a long wait. 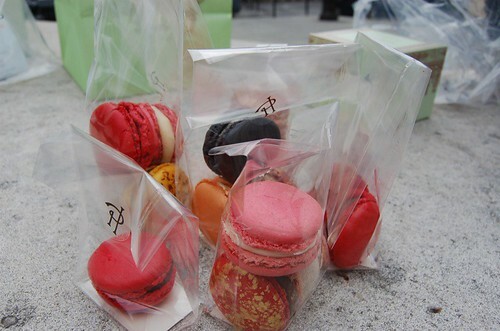 Although I generally do not like macaroons since they are too sweet, these were macaroons so delicious that I don't think I can ever have another one again without feeling a sad yearning for PH. 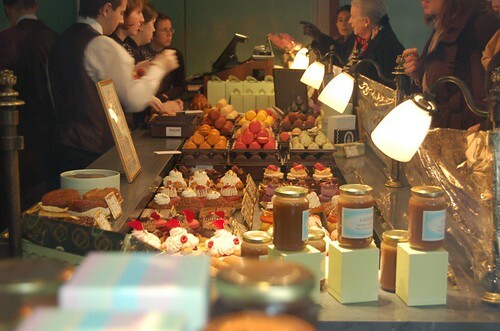 We hopped down the street to Ladurée, which has a strict no picture policy. As you can see, I am quite good at playing dumb and deaf, but even then I was only able to sneak in a couple photos. 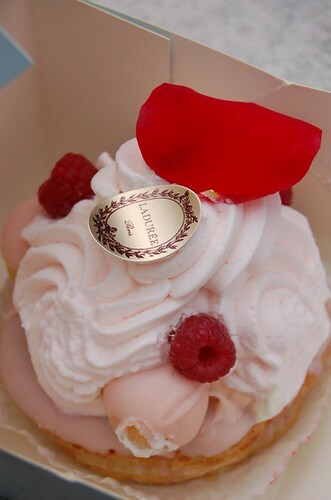 I chose the most Marie Antoinette-ish pastry possible: rose cream pastry with small cream puffs and a rose jelly center. Light and moderately sweet, this was a well balanced dessert, bursting with rose flavor but subdued so that it was refreshing. 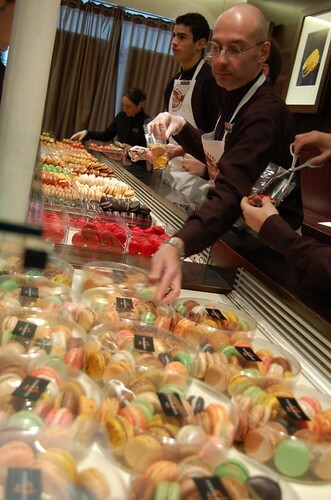 Since Pierre Herme only had macaroons the day before, we decided to return for some pastries. 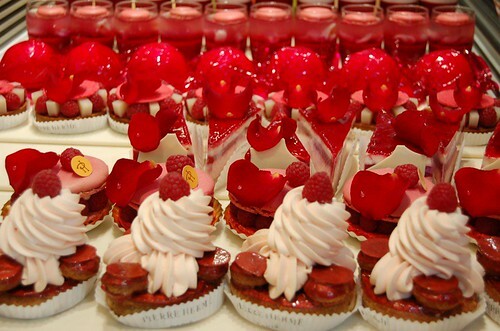 Pierre tends to go overboard on the rose, raspberry, and lychee. Other wonderful things I didn't get to taste. The infamous isaphan, on steroids. 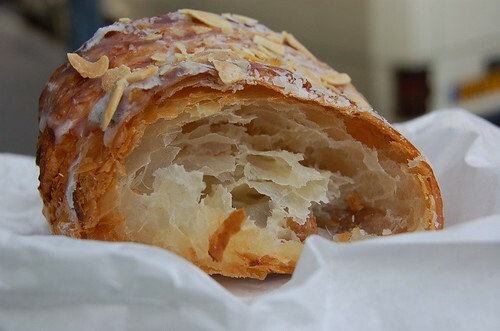 I bought a croissant to go, and it turned out to be the best croissant I've ever had. 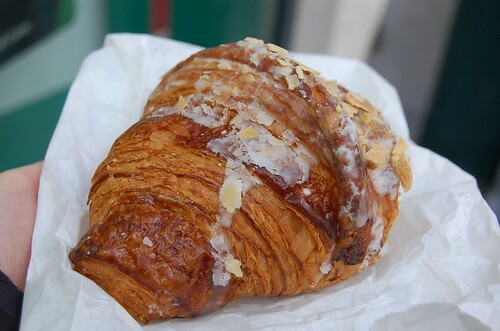 Ethereally crunchy on the outside, with melt-in-your mouth flakes inside, this was light even with the rich almond cream. 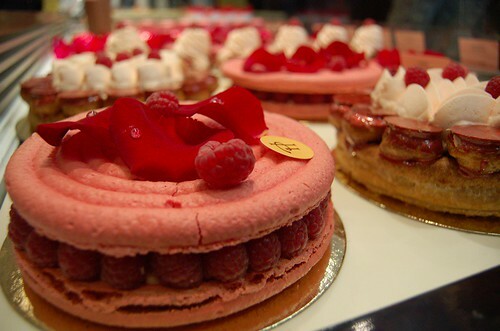 Another pastry pilgrimage is in order. 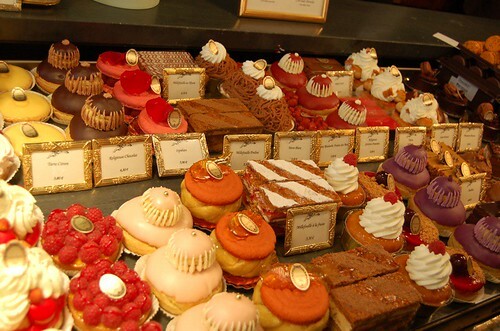 Until then, I am accepting fed-exed Parisian pastries, thanks.